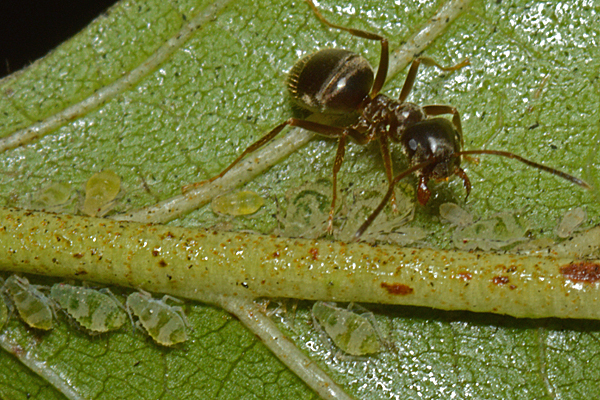 The Pterocallis maculata alate (see second picture above) has a pale green abdomen and dark-tipped siphunculi. 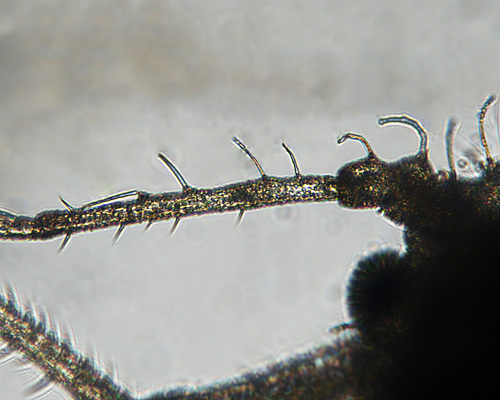 The first micrograph below shows the long hairs on antennal segment III; the second shows the dark capitate hairs on the abdominal segments. 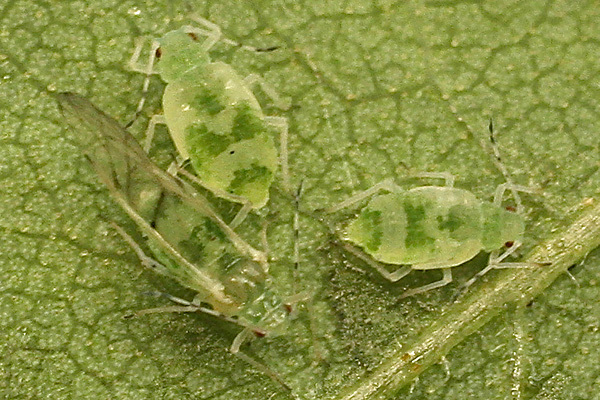 Despite many years of searching alder in southern Britain, our first encounter with this aphid was when photos of it were sent to us by Alan Outen from Bedfordshire. 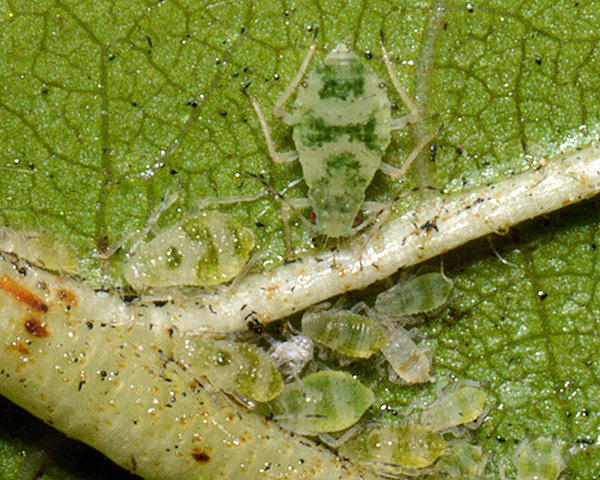 The images below show both immature and mature alates in their characteristic position along the veins on the undersides of the leaves of common alder. Images above copyright Alan Outen, all rights reserved. On a later visit to Bedfordshire, we found the species ourselves on alder trees bordering a layby. 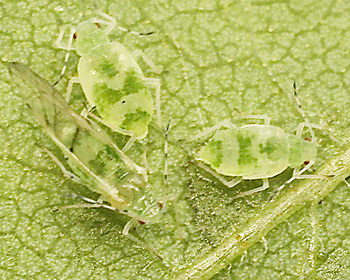 Our attention was drawn to the aphid populations by the presence of Lasius ants attending the aphids. 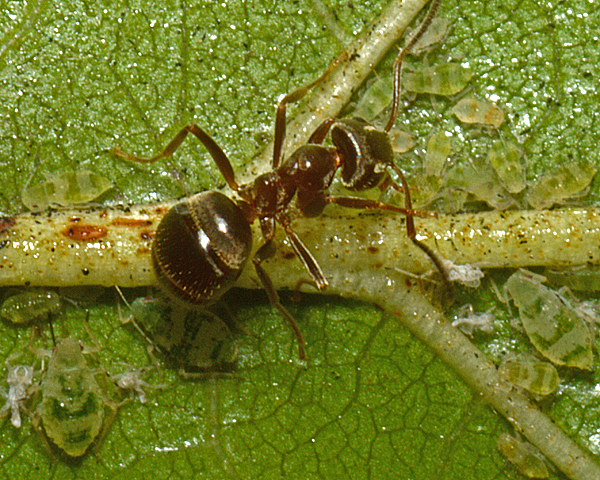 The ants were nesting between the trunk and a protective plastic cover around the tree base (used to prevent herbivores damaging young trees). Very little seems to have been written about Pterocallis maculata, presumably reflecting its scarcity. 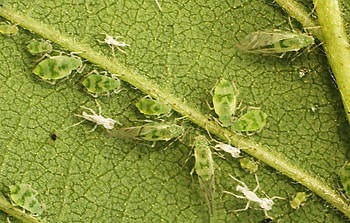 In ornamental nurseries in Poland Labanowski & Soika (2011) found Pterocallis maculata on grey alder (Alnus incana). 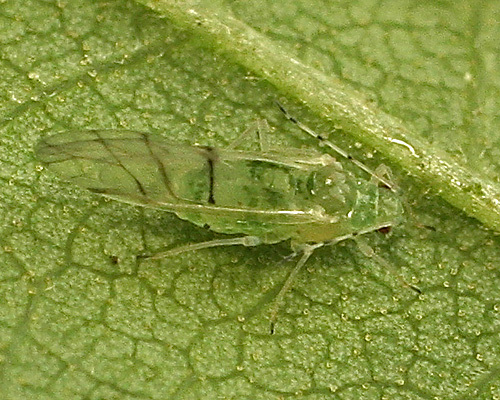 Only Pterocallis alni was found on common alder (Alnus glutinosa). 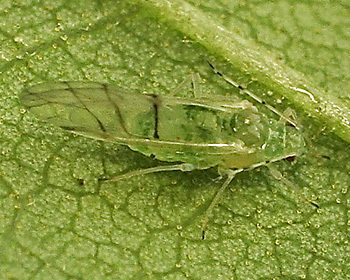 Pterocallis maculata has been recorded from 4 Alnus species (Alnus firma, Alnus fruticosa, Alnus glutinosa, Alnus incana). 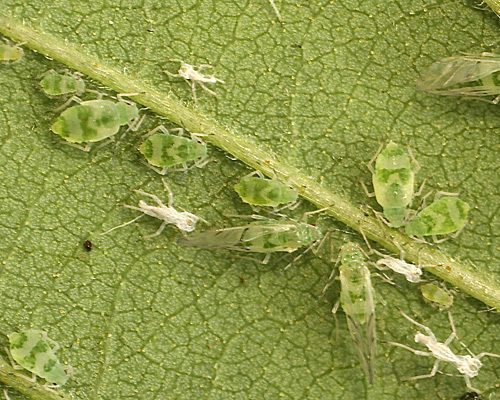 Blackman & Eastop list 8 species of aphids as feeding on common alder (Alnus glutinosa) worldwide, and provides formal identification keys for aphids on Alnus. 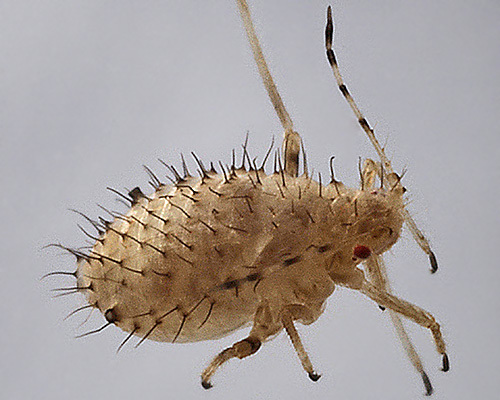 Of those, Baker (2015) lists 6 aphid species as occurring in Britain: Clethrobius comes, Crypturaphis grassi, Glyphina betulae, Pterocallis alni, Pterocallis maculata, Stomaphis quercus and Stomaphis wojciechowskii. We especially thank Alan Outen (Bedfordshire Invertebrate Group, for much assistance, and some of the images above. [This] was on Alnus cordata (Italian Alder), a host for which Blackman and Eastop give possibles as: Crypturaphis grassii; Pterocallis alni. This is surely a Pterocallis sp. and I thought P. alni and mine does indeed seems to match some on-line illustrations of this but does not look like your images or description of this species. Nice piccies! They appear to be Pterocallis maculata, a species we've been after for ages. I know P. maculata is not given by Blackman for this alder species, but there is no reason why it should not also occur on A. cordata. Was it ant attended??. It is supposed to be nearly always ant-attended whilst P. alni is much less so. I think I know the on line piccies you're referring to for P. alni - they are also (I think) P. maculata. I am very pleased about Pterocallis maculata. Feel free as always to use the images if you wish. I do also have more. There were not a lot of ants in attendance with these but certainly a few.